Death of Rev. Stanley L. Jaki O.S.B. Death of Rev. Stanley L. Jaki, O.S.B. Rev. Stanley L. Jaki, the world-renowned Hungarian-born author, physicist, philosopher and theologian died April 7 in Madrid, following a heart attack. Known as a leading thinker in areas at the boundary of theology and science, Jaki was awarded the Templeton Prize in 1987. He was cited for delineating "the importance of differences as well as similarities between science and religion, adding significant, balanced enlightenment to the field." He had traveled to Spain from Rome where he had lectured last week on his latest book at the Renaissance-era Casina (Garden House) of Pope Pius IV, headquarters of the Pontifical Academy of Sciences, of which he was an honorary member since 1990. He was 84 years old. Father Jaki belonged to the Benedictine religious order, having joined as a novice in 1942, professed his solemn vows in 1944 and been ordained a priest in 1948. Survivors include two brothers, both also Benedictine priests: Rev. Zeno Jaki, O.S.B., and Rev. Theodose Jaki, O.S.B., who reside at St. Martin's Archabbey in Pannonhalma, Hungary. He was the last surviving co-founder, with six other Hungarian priests, of the Woodside Priory, Portola Valley, California. He served there as bookkeeper from 1957 to 1960. He later left the jurisdiction of that priory when it merged with another in Manchester, New Hampshire but remained a Benedictine under direct supervision of the archabbot of Pannonhalma. Jaki was a Gifford Lecturer at the University of Edinburgh, 1974-75 and 1975-76, the prestigious, century-old academic appointment in the disciplines of philosophy and theology, which has included as past lecturers Hannah Arendt, John Dewey, William James and Albert Schweitzer. He was deeply committed to the conjunction between faith and reason, arguing that the flourishing of science in Europe was intrinsically related to the Christian understanding of creation and the Incarnation. "Although the world was God's creation and, as such, to be profoundly respected, the world itself possessed no intrinsic divinity," Rev. Thomas G. Guarino, professor of theology at Seton Hall, stated. "Father Jaki's work elucidated the notion that in understanding the very laws of the physical universe, science naturally opened out toward the affirmation of faith." He joined the faculty of Seton Hall University in 1965, attaining the rank of Distinguished University Professor in 1975. In addition to the Gifford Lectures, Jaki taught widely throughout the United States and Europe, at Yale, Harvard, Oxford, the Sorbonne, and the Gregorian University in Rome, among scores of institutions. He published more than 40 books and hundreds of articles, chapters and essays over 50 years. He wrote widely on the history of science and religious questions, including a number of volumes on John Henry Newman. His books included The Relevance of Physics, Science and Creation, Chesterton: A Seer of Science, God and the Cosmologists and The Purpose of It All. His sppeches to the Pontifical Academy of Sciences are collected in Lectures in the Vatican Gardens. 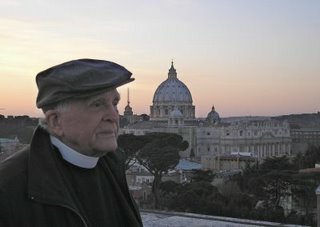 Father Jaki received doctorates in theology from the Pontifical Institute of San Anselmo, Rome, in 1950 and physics from Fordham University in 1957. He conducted post-doctoral research at Stanford University and the Institute for Advanced Study in Princeton, NJ. He received numerous honorary doctoral degrees, including one from Seton Hall University in 1991.